Roma histories and experiences differ greatly according to geographical region due to the policies that controlled and influenced how they were officially allowed to interact with local populations, where they lived, how they earned a living, and the extent to which the state attempted to control and change their ways of living. In Poland today, there are approximately 20,000 Roma, a number that is drastically smaller than the Roma populations in Romania and Hungary, where they constitute the largest national minorities. Poland is home to various subgroups who take their names from traditional ways of making a living. Bergitka Roma (also known as Carpathian Roma) were blacksmiths and musicians who settled in southern Poland centuries ago. Tribes who were nomadic on Polish territories until forced settlement in 1964 include the Polska (Polish) Roma who have lived on Polish lands since the 16th century and Kelderari and Lovari who came to Poland in the second half of the 19th century. Polska Roma found protectorates among the Polish nobility because of their crafts and were not restricted by feudal law to the land as Polish peasants were. This allowed them to move across the lands and not to be tied down to a certain locale. Today there are many tensions among descendants of nomadic Roma and settled Roma in Poland. 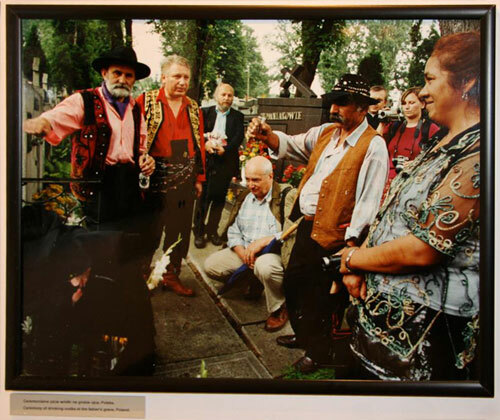 The history of these groups is featured in the Ethnographic Museum in Tarnow as part of the permanent Roma exhibit run by curator Adam Bartosz. The first Roma museum of its kind (the Roma museum in Brno, Czech Republic, is the largest), it was established in 1990 and depicts a history of Roma presence in Poland, including the history of Polish Gypsy kings who were appointed by the Polish rulers to represent Roma communities in relationships with non-Roma. In 2001, Dr. Adriana Helbig had participated with a group of Roma intellectuals from Ukraine in the Caravan of Memory. She slept in wagons and washed in the river and learned the behaviors deemed appropriate by descendents of nomadic Roma groups regarding notions of cleanliness. A woman’s body is deemed polluted from the waist down, as is the skirt she wears. During menstruation, a woman is not allowed to prepare food or to allow food to touch her skirt. A traditional Roma skirt includes an apron with special pockets for food so that it does not touch the skirt itself. As we walked through the museum, the students found a picture of Adriana from her experiences at the Caravan of Memory. She recalled the scandal she had nearly caused in her flowered red skirt. The more than 100 Roma participants had set up base camp near a lake and had begun cooking the food on portable stoves. They had set up camp fires and everyone was sitting back on logs and chairs they had brought with them in their cars and campers that followed the four wagons pulled by horses who led the Caravan on its 30 mile journey through the surrounding villages near Tarnow. Adriana noticed a bench in the distance and thought to sit on it to change the film in her camera. Women from inside a tent noticed that she was heading toward the bench and grabbed her from behind, seconds before she sat on it. They were planning to use the bench to serve food, and had she sat on it, the bench would have been considered unclean and unsuitable. Many times during her fieldwork in Ukraine, Roma women would say that Adriana was unclean, but they meant she was “dirty” because she did not wash the floors of the house she was staying in (as did other women in the settlement) and not due to pollution taboos. Not all Roma adhere to such taboos, reinforcing the cultural differences between Roma groups in different countries. At the Ethnographic Museum in Tarnow, Poland, Adam Bartosz prepared a campfire for us. 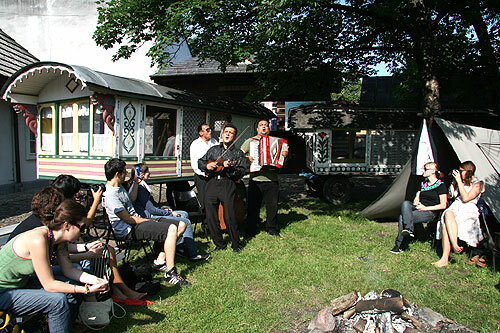 We were treated to a private concert by Romanian Roma musicians who presently live in Krakow. An ensemble comprising a violin, double-bass, and accordion, they work as restaurant musicians. They began their concert for us with a typical restaurant repertoire that included the recognizable Czardas by Vittorio Monti. Selections of Django Reinhardt’s Gypsy Jazz repertoire eventually gave way to more traditional music as the band realized that the students were familiar with various Romani songs. The full soundtrack from the popular Soviet film “Tabor Ukhodit v Nebo” (Gypsy Camp Ascends to the Heavens) was interspersed with Balkan favorites, including “Chaje Shukarije” (Beautiful Girl), a now-classic part of the University of Pittsburgh’s Carpathian Ensemble repertoire. We were treated to a private concert by Romanian Roma musicians who presently live in Krakow. We danced, clapped, sang, and played along with our musicians friends for more than two hours. It was a great opportunity for students to speak with Roma musicians and ask them about their musical choices, see their improvisations up close and watch them interact with the audience. It was a very big change from how we had first engaged with “Gypsy” music at the Khamoro festival, and we saw the professional side of Romani music making, where musicians appropriate a wide-reaching repertoire and gear their music-making to appease predominantly non-Roma audiences in restaurants, similarly to how Roma musicians have done this in Budapest’s restaurants since the 19th century. As we proceed in our journey from the Czech Republic, through Poland, and onto Slovakia, we continue to add to our understandings of music-making among various Roma groups, which seem more complex with each passing day as we learn more about the nuances regarding history, social structure, and musical repertoires in each country.